LONDON, FEBRUARY 25, 2015 — RTW, a leading vendor of visual audio meters and monitoring devices for professional broadcast, production, post production and quality control, is pleased to announce the appointment of HHB Communications, Ltd., as the company’s new U.K. distributor. 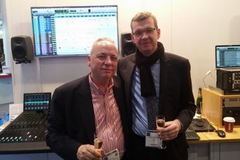 HHB, which is currently highlighting RTW’s latest broadcast audio products at BVE 2015 (Stand J43), has been dedicated to delivering the latest and most innovative pro audio equipment solutions to the world's top broadcasters, recording studios, post facilities and systems integrators since 1976. HHB will distribute RTW’s entire line of products, including the TouchMonitor hardware range and the new Mastering Tools software, an entirely new range of products that provides the functionality of RTW’s TM7 and TM9 basic PPM instrument meters as standard-format plug-ins for Windows and Mac OS.